Taking time off from his busy schedule, that included a meeting with Prime Minister Narendra Modi, launching a new radio system for the Indian market and signing an agreement to expand a 3G network, Ericsson Group President and CEO, Hans Vestberg, visited the Indian School of Business (ISB), to spend some quality time with students and faculty. On the sidelines of this, in an exclusive interview with ISBInsight, Vestberg shared his vision of 5G services and the networked society. Excerpts from the interview with Reema Gupta, Associate Director, Srini Raju Centre for IT and the Networked Economy (SRITNE), at ISB. Reema Gupta: There is a lot of buzz around the Internet of Things (IoT). IDC (International Data Corporation) predicts that IoT market is going to reach $1.27 trillion with about 28 billion devices by 2020. Please tell us something about Ericsson’s vision of this Networked Society and how does it add to the well-being of the society? Hans Vestberg: As part of the Networked Society what we are witnessing is the fifth technological revolution. We are all at the moment in an industry where so many people have 3G and 4G and are connected – we are looking at 7.7 billion mobile broadband subscriptions by 2020. Suddenly we will have an enabler, which will help us to start doing many other things – not only will it improve consumers’ experience; we can suddenly transform industries with mobility, broadband and cloud. Even more important is the way it can impact society. This is the 21st century’s infrastructure – using it you can facilitate education, enhance healthcare delivery, create smart cities and reduce CO2 emissions amongst many other things. We can address so many of the challenges that we see around the world. IoT will play a big role in solving these challenges. So the networked society is much wider than you and I have in 3G and 4G. So IoT is going to be there. It will be you and me talking to a machine or a machine-to-machine, which will help to make this planet more liveable. May be you can expand a little bit on how 5G adds value when you talk about machine-to-machine talking to each other vs us, humans using 4G for communications. How is that changing and how 5G as a technology is adding to that? 5G as a technology, in terms of sign principles, is very different from 3G and 4G. 3G’s and 4G’s basic sign principle was high speed, meant to better serve the consumers – so that you and I can have a better experience. 5G is much more than just high speed. It is also an industrial internet, which means that we will think about different types of user cases, for instance low power sensors for remote areas is just one user case. Another could be an autonomous car, which could communicate its intentions to other vehicles over the network instantaneously, allowing them to coordinate their speed and lane position or avoid potential accidents. Through those two user cases, we would transform two industries – one of course in the remote areas and the other would transform the transport industry. Similarly there are numerous such user cases, where industries would benefit from mobility, broadband and cloud based on 5G. And that’s a design principle that we have for 5G. As part of the Networked Society, what we are witnessing is the fifth technological revolution. We are all, at the moment, in an industry, where so many people have 3G and 4G and are connected – we are looking at 7.7 billion mobile broadband subscriptions by 2020. Even more important is the way it can impact society. This is the 21st century’s infrastructure – using it you can facilitate education, enhance healthcare delivery, create smart cities and reduce CO2 emissions amongst many other things. Do you think there are going to be one or two industries which will be leaders in the adoption of this technology? Will 5G be more consumer oriented or industrial user oriented? Initially, it will be more consumer oriented because consumers have the 3G and 4G mobiles. It will be similar to the dramatic disruption that happened in the music industry – from CDs to digital medium to subscriptions. We are seeing the same thing with videos – Netflix is transforming all the TV viewing. Consumers are always the first. My discussion with the industry leaders – from transport industry, governance (how can they use e-governance model much more efficiently), companies in the process industry (how our sensors can improve their processes). So this is going to be the second phase of the networked society when industries will be involved directly. So you have spoken of governments playing a very important role. In India, there is this initiative by the Modi Government – the smart cities project. How does India’s infrastructure need to evolve, to be able to play a critical role, so that it’s able to leverage these technologies for its citizens? I have now worked for last five years with the UN and talked a lot about how ICT can transform countries. The first thing you need to have of course is infrastructure – the broadband infrastructure, the mobility broadband and 3G and 4G. In five years from now, India will have very big portion of its population with 3G and 4G, so that’s going to grow exponentially. That’s why, it’s timely that the new government in India is thinking of a digital agenda or a digital India – very important because you should not start then, you must start now. We of course see initiatives like – smart cities, healthcare, education going digital – those plans are there right now. So I would say, my discussion with the Government has been very much about ‘execute what you have,’ because it will be vital for having competition or for being competitive, because all 100 countries across the world are thinking the same. We have a challenge – many in the Government are in dilemma whether to lay a cable or should we go wireless. What would be your recommendation? In many cases not laying cable will be the right thing to do since wireless solution is way quicker; secondly wireless is much cheaper. But we will still need fibre – fibre to transport all the data, but the last mile will be wireless – it can be wifi, it can be 2G, 3G, 4G and 5G. So I think this will be seen in the whole world – when majority of the population will have internet through wireless not through wired lines. These would be so first for cost reason, and second for the speed reason because it is so much easier and quicker to roll out wireless network. Of late, there has been a lot of debate around net neutrality, so please share your opinion, given you are member of internet.org. What do you feel is the way forward? You know you have to make it economical but at the same time you need to understand how to give access – that’s the main concern of internet.org. But at the same time some people feel that this will give an unfair advantage to some companies, especially when you talk about Internet of Things. Now companies have devices, which are sending data packages. How will the economics of this workout? I have been one of the founding members of the UN’s Broadband Commission for Digital Development. I have been an advocate for broadband for everybody. That’s my biggest wish – for everyone to have internet connections. But the question of net neutrality cannot be answered with a ‘yes’ or ‘no’ – it requires a little bit more analysis, the reason is that I’m sitting thinking what networks would be like five years from now, ten years from now. Think about when you connect to cord – maybe then you should talk so much about net neutrality. But when you connect all the cords – to improve the traffic planning, to avoid accidents, etc., then we need to understand that we need to have different lanes in the network in order to get all the possible impact, which we need to have for a prosperous and forever green planet. In order to reduce CO2 we need to use ICT. I think then we will have a much broader debate. Here needs to be a broader way of thinking about net neutrality. 5G as a technology, in terms of sign principles, is very different from 3G and 4G. 3G’s and 4G’s basic sign principle was high speed, meant to better serve the consumers – so that you and I can have a better experience. 5G is much more than just high speed. It is also an industrial internet, which means that we will think about different types of use cases. Innovation Lab that you have setup at Facebook is basically for trying out different technologies, experimenting with the use cases. Are you considering establishing similar setups in the emerging countries and could ISB be one of them? We are the lords in the mobile infrastructure; we are leaders in 3G, 4G, and we are planning to be No 1 in 5G as well. So we have to work in an ecosystem which will enable us to understand how the ecosystem can work better. That will be extremely important. Now we need to talk to industries, application developers and entrepreneurs. So we could be working with ISB, we could be working in India when the network and the markets are ready. You are right, if there is lot more density here and different demands from the network then may be it can serve as an innovation hub. That’s exactly why we work with Facebook, because sometimes in markets a lot of time an application developer has 4G and fibre and so s/he believes that whole world is having the same experience and then develops an application that’s going to work for them. But we know the truth being in 180 countries – that everyone doesn’t have the same experience. If you do a very intense video solution and you have only a 2G market then it’s not going to work, it will be frustrating – so we work before with Facebook on different kinds of products so that they know how to launch the products in different kind of markets. Why are you testing 5G in Korea first? Because Korea has the Olympics in 2018 and they want to showcase it, but we have tested it elsewhere as well. So would they be advanced in certain ways? They wanted to take a lead in 5G. Remember 3G was launched in Europe; 4G in USA and in Japan to a certain extent and for 5G everyone is battling to take the lead and, we are going to be where there would be the most number of consumers. 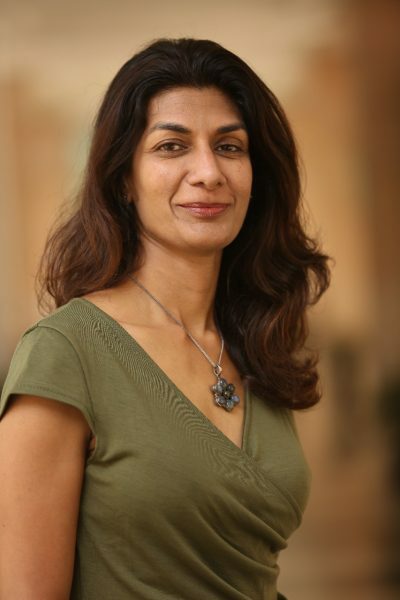 Reema Gupta, Head of the Centre for Learning and Management Practice at ISB.